Aikido is about moving and being Centered. 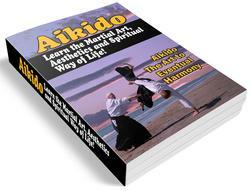 You will hear a lot about this, but some basic ideas will help you understand this key Aikido concept. There are two basic aspects of centering practices, emptying out and filling up. Emptying out is the process of letting go of rigid patterns. Filling up is the process of enlivening the mindbody with relaxed strength. Emptying out is releasing energy blocks, and filling up is energy extension. Head erect. Eyes level and vision expanded. Back vertical. Shoulders relaxed and even. Belly relaxed. Hips even. Arms in an open curve. Hands and fingers open. Knees not locked. Feet in hanmi in full contact with the floor and with equal weight on each. Power comes from the legs and hips and is channeled through the spinal column to the arms and hands. Every part of the body is equally involved in every movement. Alert and relaxed awareness of yourself and your surroundings. 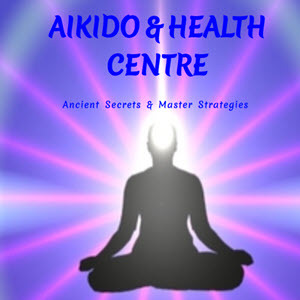 The energy qualities of Aikido are called "Center" and can be described in terms of a balance and unification of all qualities. In Aikido, the hand is often referred to as the "hand blade" (literally the "hand sword"). We hold our fingers open and extended so that the heel of the palm and bottom of the arm are elongated while the top of the arm remains relatively relaxed. In this manner the natural curve of the arm resembles the shape of the Japanese sword, katana. Sometimes the basic Te-sabaki are referred to as the Te-gatana no sosa, or "the use of the hand-blade". Triangular stance b. Each type is performed as one step. Enter to the blind spot, shikaku. Both feet must move during each step! Get off the line of attack. Note: The principle of Irimi-Isshoku implies that you must reach the blind spot behind your partner in a single motion. In these diagrams, foot movements are numbered; 1, 2, 3 However, each type of stepping illustrated is nonetheless a single step. For example, ayumi-ashi is considered one step wherein both feet move. This principle is important for getting off the line of attack. How to do tenkan movement?